I think it’s fair to say that many little girls love princess tales, especially the ones created by Disney. If your child also dream of the royal life, then Disney Princess: Story Theater will be an instant hit with them. 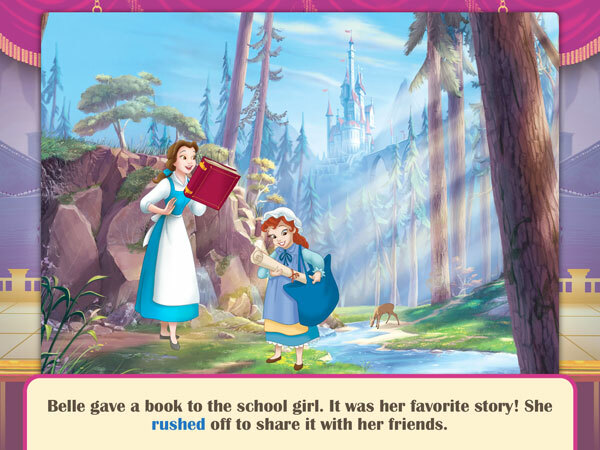 Released by Disney, Disney Princess: Story Theater is an interactive app that allows you to create the perfect story using characters, locations, and props from Disney’s animated movies. 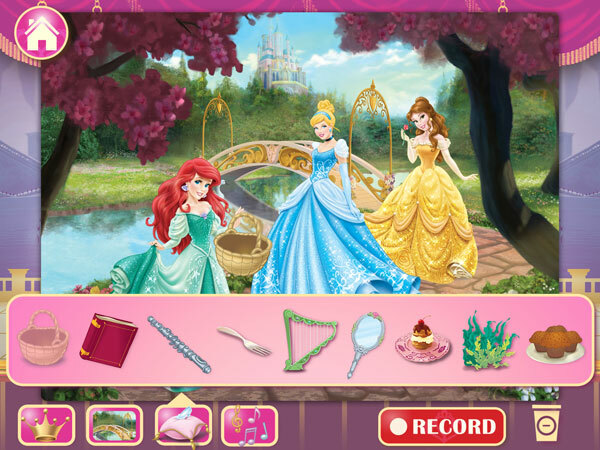 The app features three beloved princesses — Ariel, Belle, and Cinderella — and comes with two playing modes, Story Play and Free Play. Story Play is a guided playing mode in which the app provides a story based on your selection of characters, location, surprise, and prop. It's a great mode for beginners because it walks them through the structural elements of a story. Free Play, like the name suggests, allows you to pick any combination of characters, locations, props, and music. Here, the story is up to you, and you can start recording any time by pressing the Record button. 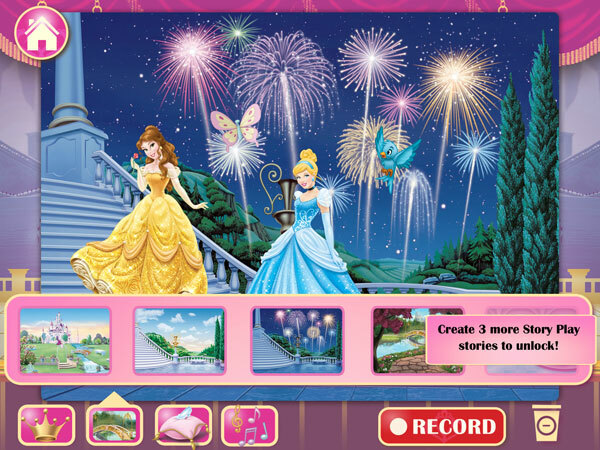 To begin recording in Story Play, you select a princess and a location for your story. For example, you can choose Belle in her father’s workshop or Cinderella in the barnyard. After you make your choices, a narrator will read a short passage for you to animate. You can then move, resize, and rotate the characters, and record your voice. This process is then repeated until you have selected a surprise and a prop to complete your story. You can then save your work and replay it. Free Play has a similar workflow, except that there is no narrator and you can add characters and props whenever you want. I do have to mention that several location choices are only unlocked when you have created a number of Story Plays, presumably to ensure that players already have a grasp of how to create a well-structured story. Select your characters and animate them to enchanted stories. 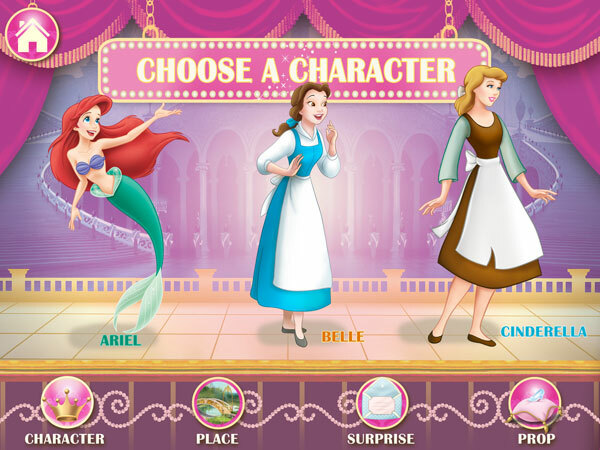 Disney Princess: Story Theater is intuitive and easy to use. There are narrated directions and visual tutorials throughout the app, and kids ages 3-7 should be able to get started with little help from grown-ups. While the app is mainly for entertainment purposes, it also has some educational qualities. In Story Play, the app promotes early literacy by displaying the story in text as well as highlighting each word as it is narrated. A highlight of the app is the in-app guide that provides interesting suggestions for reinforcing your child’s understanding of story structure through offline activities. Parents need to know that the app does not contain in-app purchases. However, it includes links to Disney’s other apps on the App Store in an unprotected Information section. When I was contacted to try Disney Princess: Story Theater, one question that I had in mind was how similar it would be to Sophia the First: Story Theater, which we reviewed back in February. Well, after trying both apps I have to say that there are enough differences between the two to justify having both apps. The highlight of Disney Princess: Story Theater is its selection of characters. Most little girls are likely familiar with classic Disney Princesses, which makes the app appealing for them. The app also teaches juniors about story structure through Story Play mode — a feature that the Sofia the First: Story Theater does not have. Like any other Disney apps, Disney Princess: Story Theater is lovely to look at. The app’s painterly graphics and delightful music help set the stage for the enchanted princess theme. The smooth transitions between each scene makes the recorded stories in Story Play look great. I also like that the app is simple to use. Granted, I did find pinching to rotate and resize items can sometimes be difficult for tiny fingers, but it is not a critical issue. The multi-touch support means parents can also play along with their kids. Disney Princess: Story Theater is a terrific learning tool that puts your child in the director’s seat and allows them to create their own spin on traditional fairytales. I like that it engages kids in a creative gameplay by using well-established and beloved princess characters. It is also intuitive and easy to use. All in all, it is a great app that I would recommend. Cookie Next Door ~ Rainy Days. Record your own dialogs for a comic book adventure and see it come to life.